As the Chief Operating Officer of ELAN Entertainment, a subsidiary of ELAN Group that owns Novo Cinemas theatres across the region, I am routinely asked my view on the future of cinema. Entertainment is growing to include increasingly accessible, premium content across multiple digital platforms, and streaming services are viewed as a threat to the cinema industry. But while average consumers in other regions, particularly the United States, are more interested in watching movies at home, filmed entertainment spend in the Middle East and Africa is expected to reach $1.45 bn by 2019, according to a study released by PwC. Despite a changing landscape, movie theaters in Qatar are thriving as our offerings include new experiences, greater comfort, and advanced technologies. In the face of challenging weather and limited outdoor entertainment options, cinemas are one of the most loved sources of entertainment in the region. Novo Cinemas has emerged as the regional leader of cinema innovation by offering our guests A Great Time Out due to our customer-centric approach. We focus on creating entertainment experiences specifically personalized to every community across the countries we operate in, inclusive of various demographics and income levels. The model we follow in establishing cinema theatres creates cinematic experience hubs which changed the concept of a cinema outing into a self-indulging holiday for each one of our customers. At Novo we provide our guests with the freedom to choose from an array of cinema experiences: 2D, 3D, 4D, IMAX with laser technology, ATMOS, luxurious 7-star suites, and the recently launched Novo Majlis. Extending beyond the traditional theater experience where people watch a movie and eat popcorn; at Novo we support the in-cinema entertainment and our theaters offer bowling, bespoke gourmet menus for movie-goers, dedicated butlers for couples and various luxurious services/ programs. 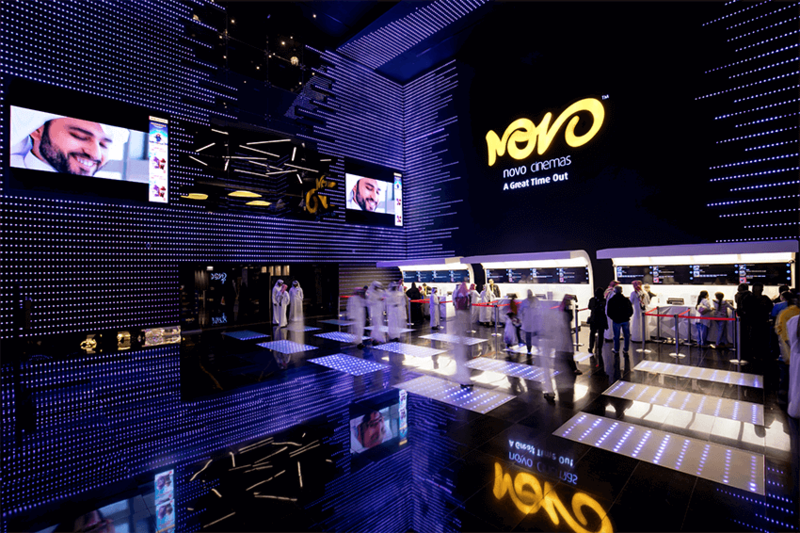 Novo Cinemas was awarded the title of The Most Innovative Cinemas in the Middle East Region in the ComiCon ME 2017. The personalized experiences that Novo Cinemas offer for different audiences in various geographic locations were the secret ingredients to this acknowledgment. Novo’s team of experts performs a detailed market analysis study in the locations we operate in or planning to do so to build an in-depth understanding of customers’ behaviors and further build on and tailor the services we offer. Each of our locations is personalized to meet the demands of its respective set of customers, such as offering valet parking at our Pearl Qatar location. In addition to this, customers’ behaviors play an essential role in tailoring our movie screenings to the demographics of particular locations, so that customers are provided with options that are most in line with their preferences. Novo is not only consumer-centric, but also positioned as an attractive and lucrative business partner for real estate developers. Our CapEx model means that we provide the services, while the asset itself is owned by our business partner. This model ensures that we understand, work and communicate with our business partners while guaranteeing the high-quality standards our customer base has grown to love. Novo has proven, again and again, to be a valuable source of income for our business partners as our cinemas drive significant amounts of foot traffic at our operational locations. Novo Cinemas attract high and mid-income level individuals, the target demographic for our business partners, particularly mall owners. The foot traffic generated by Novo generates ancillary revenues, as movie-goers shop, dine and visit other retailers in mall in the process. Real Estate developers, like Oman’s TAMANI Group, are recognizing the value in incorporating entertainment brands, like Novo Cinemas, into their portfolios. Oman will soon see the launch of two Novo Cinema megaplexes at two major developments, that are Mall of Muscat and Sohar China Downtown Malls. The growing interest for entertainment in the region means platforms, other than cinemas, can be potentially introduced to meet the demand. In the process, these projects have potential to drive traffic away from cinemas. It’s no surprise, then, that one of the challenges facing the cinema industry is to evolve to be as innovative and creative as possible while retaining and growing our customer base. If platforms like Netflix and Amazon Prime provide consumers with premium content that’s accessible from the comfort of their own homes at low prices, what does the future of cinema look like? The ‘lone spectator’ experience that streaming offers can’t be compared, in my view, to the experience of sitting in front of a screen and watching a film surrounded by dozens of other moviegoers. Having remained constant for 100 years, the cinema experience is one that’s loved by many, and we’re retaining the importance of cinemas in the entertainment culture by creating luxury and comfortable experiences that make movie-goers feel more at home. Working hand in hand with partners who recognize the cinema industry’s potential, I believe there’s enormous business opportunity in entertainment here, and we’ll continue to adopt the latest viewing technologies and seek out innovative entertainment solutions. At Novo Cinemas, we’re committed to offering the most state-of-the-art experiences to our customers, and our focus to evolve the cinema experience is what will keep driving us forward.